In most situations your buffer is the person who cushions the blow and makes things a bit easier. They know how to stand in between and make things less intense for others. 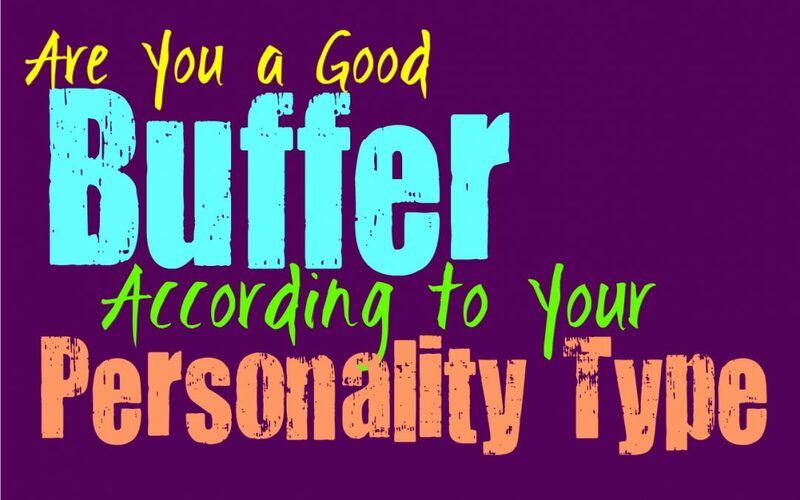 Here is how good you are being a buffer, based on your personality type. INFJs often make for excellent buffers, since they are so in tune with the emotions of others. They are often willing to stand in the way when someone needs their assistance. INFJs are even willing to take the heat for something if it means protecting a loved one. They aren’t afraid of being the one to stand in the gap in order to make things easier for others. They also make great buffers in the sense that they can be there to support their loved ones and make them feel more comfortable in stressful situations. ENFJs often make great buffers, especially when it comes to protecting their loved ones from harm. They will stand in the way and calm the situation, or take the heat for the sake of someone they love. ENFJs often put themselves in harm’s way in order to cushion the blow for the people they care for most. They will do anything to ensure that their loved ones are safe and happy, and this sometimes means being the buffer. ENFJs also makes good buffers by making the situation more comfortable and helping their loved ones feel more relaxed around others. INFPs don’t often enjoy being the buffer in a situation, since they might be the one in need of the buffer. They are capable of standing in the gap if they must, especially with people they are truly close to. In most situations INFPs are in need of someone who can help them feel more at ease when they are a bit anxious about stepping into certain surroundings. INFPs just aren’t the ones to make a situation less awkward, they might even enjoy the awkwardness on occasion. They can become so caught up in their own thoughts that it becomes challenging for them to really create that buffer. ENFPs aren’t usually buffers in most situations, since they can become so caught up in their own actions and thoughts. They might become too distracted to really be the best buffers, especially when they are interested in socializing themselves. For the ENFP being a buffer isn’t something that comes naturally for them, and they can become a bit too caught up inside of their own feelings and minds. They are independent people and so they rarely think about the fact that someone else might be feeling awkward in a new situation, this just isn’t something they often relate to. INTJs aren’t usually buffers, mostly because they are independent people who are focused on taking care of their own concerns in life. They don’t find themselves focusing on if someone else is in need of a buffer to make themselves feel more comfortable, since the INTJ often feels like they can handle this themselves. This doesn’t mean they do not care, it just means they don’t seek to really coddle people and would rather give them a chance to take care of themselves with smaller things like this. ENTJs aren’t usually buffers, but they can make for good distractions when someone is feeling uncomfortable. ENTJs simply don’t pay enough attention to this type of thing to really realize that they need to be a buffer for someone. They are independent people who often feel like everyone should take care of themselves in most ways, especially when it comes to just feeling a bit awkward in a new situation. If someone they love asks for them to be a buffer, then they might change their tune and do their best to help them out. INTPs won’t naturally find themselves being a buffer in most situations, since they can become so caught up inside of their own minds already. They don’t naturally understand or connect with the emotions of others, which is often necessary for being a buffer. While this isn’t something they commonly do, the INTP will behave differently if a loved ones asks for their help. If someone they care feel is feeling uncomfortable the INTP will certainly do their best to make the situation less awkward for them, since they don’t want to make them feel uneasy. ENTPs can become rather caught up in their own actions and so sometimes this prevents them from being a buffer. While they are independent people, they can often tell when someone is feeling uneasy or really needs someone to make them feel more involved. The ENTP is often capable of bringing people together and making them feel a bit more comfortable in a situation. If they care for someone they will often be willing to provide a buffer in order to make them feel less anxious. ISTJs don’t often find themselves becoming buffers in most situations, mostly because they are independent people. They aren’t connected to the emotions of others and so they don’t naturally understand when someone requires a buffer. If someone the ISTJ cares for makes it clear that they are feeling awkward and need them to help, then they will adjust their behavior. The ISTJ will do their best to make things more comfortable by standing in between and providing a buffer for this person, it just isn’t what comes naturally for them. ESTJs don’t naturally become buffers simply because they are independent people who don’t immediately recognize that this is necessary. They step into social situations with ease and don’t often realize that other people really need them to provide a buffer. They will be protective of their loved ones, and so if they simply let the ESTJ know they are feeling awkward they will do their best to be a buffer. It just isn’t something that happens naturally for the ESTJ, since they aren’t in tune with the emotionally needs of others. ISFJs can often provide a great buffer when their loved ones are in need of this. They don’t like awkward or uncomfortable situations and so they do their best to make things more comfortable for everyone involved. They care about creating a sense of harmony in their environment, and sometimes this means being the buffer. ISFJs do whatever they need to in order to make others feel comfortable and create an environment that is peaceful and happy. ESFJs can definitely be great buffers, especially since they naturally recognize when someone is feeling awkward. They are good at steering a situation or conversation in the direction they wish, and this is often done in order to make people feel more comfortable. ESFJs do their best to stand in the way when someone needs them to be their buffer, and they will do their best to navigate this situation for the sake of someone they love. ISTPs don’t naturally find themselves becoming the buffer in most situations, since they are rather independent. For them it just doesn’t come naturally to provide a buffer for others, and isn’t something they really think of. They focus on doing things their own way, and often believe that others can take care of themselves. For the ISTP being a buffer is something that is done for children, not for adults. So they don’t really feel the need to stand in the gap when someone is simply feeling a little awkward. ESTPs don’t naturally find themselves trying to be a buffer, but this is something they are certainly capable of. If someone they care for needs a little support and needs them to stand in the way, ESTPs can be rather good at this. The way the ESTP becomes a buffer is often by being the one to become center of attention. This can make others feel less awkward, since they don’t feel the need to perform a certain way or have all eyes on them. ISFPs aren’t naturally buffers, instead they might find that they need someone to be their buffer. They can sometimes feel awkward in new situations, and might need someone they care for in order to feel more at ease. For the ISFP it is nice to have someone supporting them and making them feel more like themselves around new people. While they often enjoy socializing, they can feel uncomfortable with people they do not know and so a buffer can be really helpful. ESFPs are actually capable of being good buffers, since they know how to divert attention away from someone else. They are happy to take on the attention and make someone else feel less pressure on their shoulders. If someone they care for is feeling awkward or shy, the ESFP can be good at bringing up everyone’s mood and making the situation less stressful. They simply want to make the situation fun and know how to bring up the mood for everyone.